Are you craving something sweet? If you’re in need of a sugar fix, no need to fear! Charlottesville may be known for its amazing local restaurant scene, but there’s no shortage of bakeries and ice cream shops to satisfy your sweet tooth. Whether you’re craving a warm slice of pie with a scoop of homemade ice cream on top or a sugary cupcake covered in frosting, here are a few of the best dessert places to get dessert in Charlottesville. Nestled in the trendy up-and-coming IX Art Park, Sweethaus is a kitschy cupcake and candy store that offers a unique twist on the traditional dessert. They offer two different sizes of cupcakes, so you could stick with the regular-sized or opt for the mini cupcakes and try out a few different flavors! As soon as you step into the door, the sweet smell of frosting and freshly baked cupcakes will overtake you. Mouthwatering flavors include Salted Caramel, Double Lemon, Cookies ‘n’ Cream, Carrot with Cream Cheese, Chocolate Chip Cookie Dough, and more! If you’re having a difficult time deciding which cupcake to choose, their best-selling Everything Cupcake is a heavenly combination of oreo, marshmallow, caramel, pretzels, mini peanut butter cups, and other sugary confections. Be sure to stop by for a sugar rush! Located in the Rio Hill Shopping Center, Chandler’s Bakery is a short drive from luxury apartment community Arden Place and has long been known as one of the best dessert places in Charlottesville. Owned by three generations since 1992, the bakery is basically a household name to locals. 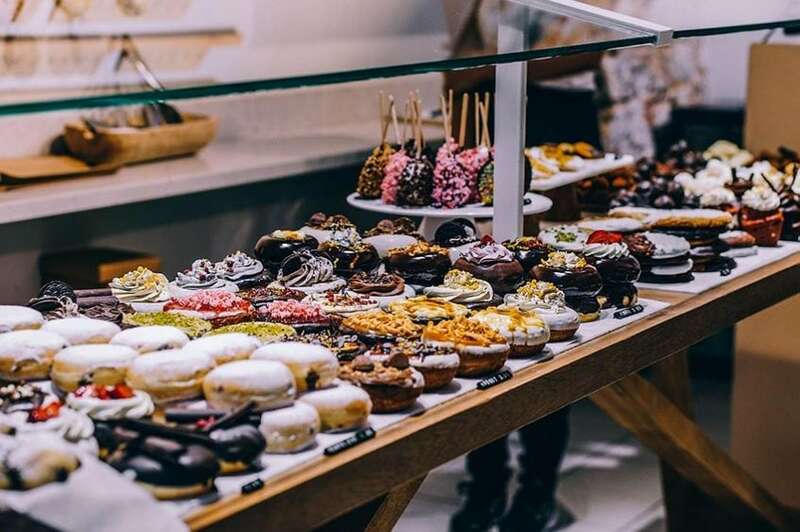 Not only do they offer tantalizing desserts such as pie, cheesecake, pastries, and cake, they also have breakfast pastries such as sticky buns, danish, and donuts. If you’re about to get married or planning another grand event, they also do wedding cakes in a variety of flavors such as Banana Nut, German Chocolate, Cherry Nut, Carrot, and Black Forest. Fillings for the cakes include Amaretto, Lemon, Raspberry Chambord Cream, Buttercream, Mousse, and Dark Chocolate Fudge. Of course, you can’t forget the frosting! Chandler’s has over seven different frosting options to top off the cake. There are endless combinations so you can create the perfect cake for your big day! Paradox Pastry is a hot-spot for locals and visitors alike looking to get a sweet fix. Owned by Jenny Peterson, a master baker who studied in Paris, the bakery’s name is derived from her love of both sweets and fitness! Of course with her background in France, the bakery dishes up buttery croissants that melt in your mouth. Pies, European-style tarts, mousse, cookies, brownies, bars, and almond pave are just a few of the desserts found at Paradox Pastry. If you’re looking to take your sweet tooth to the next level, be sure to check it out! If this list doesn’t have your mouth watering yet, then what are you waiting for? Visit one of these top places to get dessert in Charlottesville today!